Antifragility in Four Corners part 2: Which is more valuable? Welcome to our second post on antifragility. In this entry, we're going to look at the assessed value of two different businesses to determine how antifragility makes places more valuable and stable. To do this, we will do a value per acre (VPA) comparison of two properties based on their assessed value and land property area as stated on the Maryland Department of Assessment & Taxation's online database. These are the same records used to tax these properties at the county and state levels. For the first property, I wanted to pick a relatively new shopping center or business somewhere here in eastern Montgomery County that followed a suburban model of development (easy access, ample parking, etc). For the second, I wanted to choose an older property that was in a suburban area, but which did not follow the same from of development (meaning an older building with difficult car access and little/no parking on site). For these reasons, I chose the following two properties: the Target in Fairland, and Kenny's Chicken here in Four Corners. The Target in Calverton is part of the Orchard Center Shopping Center, which contains multiple other big box stores such as Kohl's and PetSmart. It has plenty of parking and is easy to access via automobile. It was also built within the last 20 years, opening in 1998, making it one of the newest suburban retail areas here in east county. Kenny's is part of a small low end strip mall here in Four Corners, and its building was constructed in 1948. It has no designated parking, and it is very difficult to access via car. A road widening project in 1996 further restricted access to the business by eliminating on-street parking out front, and creating an odd multi-level sidewalk for pedestrians. Kenny's. Photo by the author. Antifragility in Four Corners part 1: What does it mean to be antifragile? Welcome to our series on antifragility. Over the next three posts, we will detail how the Four Corners commercial district is antifragile because of it's age and form. Before this series begins, however, it is important to explain what antifragility is, as the term is relatively unknown. I learned about antifragility through Strong Towns, a grassroots movement based in Minnesota which focuses on making cities strong and resilient. Strong Towns emphasizes the importance of the traditional development pattern as a means of keeping communities financially solvent, which ensures long term prosperity through the tenets of antifragility. The concept of antifragility was formulated by Lebanese scholar and statistician Nassim Nicholas Taleb, who has written several books on the topics of randomness, probability, and uncertainty. In brief, antifragility is defined by that which gains from disorder. The antifragile is more than simply robust, since that which is robust does not gain from shocks and stressors, it simply recovers from them and stays the same. The antifragile not only recovers from unforeseen events, but it is made stronger by them. So while the term may sound negative because it starts with "anti", it is actually a very good thing to be antfragile. Let us examine what antifragilty means in the context of a community like ours. Thankfully, Four Corners bears many elements of antifragility. While we do have some fragile elements, we are in a better position than many other suburbs. A community is antifragile if it can thrive in the face of unforeseen events such as business closings, disasters, or demographic changes. This shopping center, while not filled with high end stores and lacking sufficient parking, is still much more valuable than larger auto-oriented shopping centers further out Route 29. In a later post, we'll explore why this is more valuable. Image from Google Street View. As part of the Countywide Transit Corridors Functional Master Plan approved in November 2013, Corridor Advisory Committees have been formed to give local residents, business owners, and stakeholders a voice in the planning and design process of the county's rapid transit system. The county has established five committees to study three corridors. 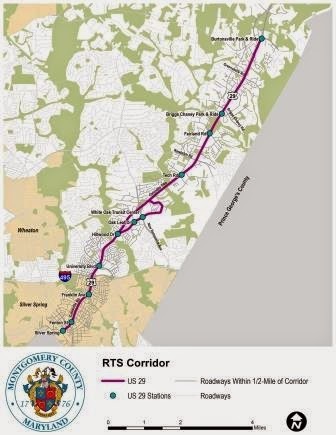 The three corridors are Route 355, Veirs Mill Road, and Route 29. Those three corridors were divided into the following committees: 355 North, 355 South, Veirs Mill Road, 29 North, and 29 South. The Route 29 South Committee is focused on the stretch of Colesville Road which passes through Four Corners. The Route 29 corridor. Image from Montgomery County rapid transit system site.